I wondered how long it would be until Bosch came out with a track saw of their very own, and now I know. It turns out that Bosch Germany will be releasing two track saws in a matter of just a couple of months. Good news for other track saw owners is that they will use a track and saw configuration that is compatible with Festool, Makita, and other tracks and saws on the market. The saws are going up against some pretty big competition with Festool, but according to the specs, Bosch has them beat on most everything. Of course it is about more then just specs, but they do play a major part. The New Bosch GKS 55 GCE will be going head to head with the Festool TS 55. They both offer the same cutting depths at 55mm (2-1/8") but the Bosch has more watts (power) at 1350 vs 1200. The Festool TS 55 does beat the Bosch GKS 55 GCE by 100 rpm at high speed (5,100 rpm), but again Bosch beats Festool in weight. Onto the big saws. Festool has the TS 75, but Bosch jumps ahead with their GKS 85 G. Again the numbers in the model are referring to the max depth of cut at 90 degrees in millimeters. So the Bosch offers a cutting depth of 3-5/16" vs Festool's 2-15/16". Those cutting depths are taken without using a track. Other then that, the Bosch saws have a number of accessories available including: rails of various lengths, rail connectors, angle guides, clamps, anti-splinter guards, etc. All in all it looks like Bosch will be giving Festool a run for their money, at least on paper. The only area that Bosch seems to be lacking in is dust collection; their saws do no appear to have a dust collection port that can be used with a collector. For some this will be a major drawback. Obviously we bring you this news expecting that these track saws will be coming to the USA at some point. When, and at what price is unknown. 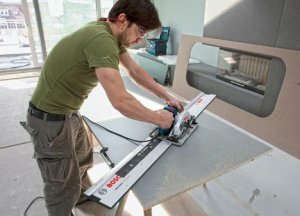 Bosch Germany users can expects the saws this July at a price of 309 euros (about $445) for the GKS 55 GCE plus 1600mm track and L-Boxx, and 409 euros (about $590 USD) for the GKS 85 G with 1600mm track and L-Boxx. Again Bosch beats Festool with price.